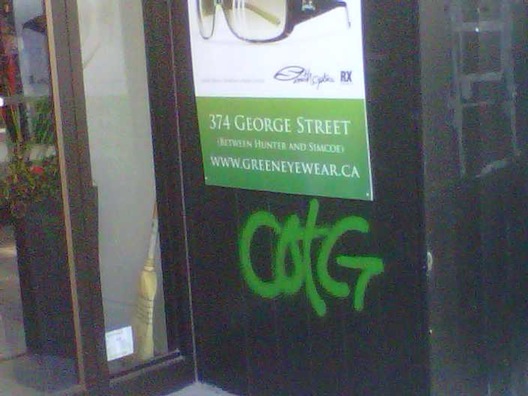 Here Are Some Pictures Of Peterborough Property That Has Been "Tagged"
It would appear gauging from tweets (click here, here and here, for examples) that incidences of "tagging" (a form of graffiti signature) are increasing around Peterborough of late, and these pictures below were sent to us of some property (Green Eyewear and Sullivan's Pharmacy) that has been "tagged". If you know of other businesses and places getting "tagged", email us with info and pics at tips@ptbocanada.com. 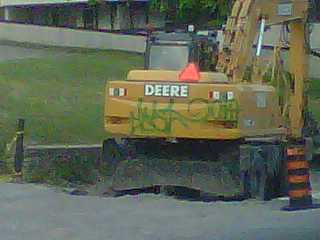 And if you have any info on who is vandalizing this property, contact Peterborough Lakefield Community Police.